Variety is the spice of life, so they say. And, this is definitely something Char-Griller believe in because their products occupy the entire spectrum of Grill designs. From Charcoal to Gas, to Propane, to portable and all the way up to huge big chunks of backyard Metal. Yep, they’ve got em all. They’re not always good and I’ve written some reviews about the bad ones. But, they’re all available. As well as offering variety, they also know how to build on previous successful designs by providing cut-price but similar alternatives. This is where the Akorn Jr Kamado Kooker Charcoal Grill (Red) comes in. It’s a smaller version of their popular Akorn Kamado Grill, and it’s on the market for around 150 dollars, so half the price of the original. In this review, I’ll be telling you if it’s worth that money. So needless remake, or future blockbuster – You Decide. 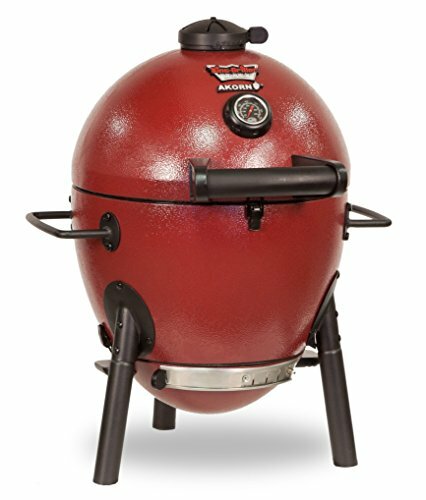 One thing this has in common with the original Kamado is its rugged looks. Notice that I didn’t say ‘good looks’. These are not the most aesthetically pleasing Grills. But they’re not supposed to be either. They’re built to mimic the internal environment of hugely expensive restaurant Ceramic Clay Ovens, to produce foods like Pizza, Steaks, Ribs and Vegetables to the succulent amazing tasting standard that only Clay Ovens can achieve. So you get a thick egg-shaped layer of Steel as the outward shell, making it look like one of those early NASA Spacecraft. On the inside it’s covered in cutting edge Ceramics Char-Griller invented for the Original Kamado. This is where they get the insulation from in place of Clay. The construction is fascinating and very impressive until you get to the smaller points. There’s no Wheels. They’ve provided a Stand and some Handles so you can pick it up. We’re talking 38 pounds so I think Wheels where needed. Also the stand looks quite flimsy like it’s not going to last a long time. As a result of this I’ve mixed emotions about the design. Great imitation of restaurant clay Ovens at a fraction of the price, but not very user friendly. It comes completely assembled apart from the Lid, the Handles and the Stand which you’ll have to screw in. But, this is a very simple job. One of the shortest assemblies on the market right now. Takes about 15 minutes. I had some problems with the size but the taste is outrageously good. It really does mimic the taste of Ceramic Oven and Clay Oven food. Given that these Ceramic Grills and Clay Grills cost thousands it’s one hell of an achievement. It does this by heat retention. Clay is a natural insulator so are Ceramics. But, while these materials assist in the creation of beautiful tasting food you’d find at restaurants, they also a lot of money. Char-Griller worked out that you can get the same heat retention from thick Triple-Wrapped Steel and their own brand of Ceramics they invented in a laboratory. So they were able to get the price down to a couple of hundred while still creating the most wonderfully succulent Clay Oven Pizza’s Kebabs and Steaks. The original Kamado does exactly the same thing so if you want one of these you’ll have to decide between space and price. The original costs double the price of this, but this only has half the space. Which is more important? Superb and excellent at dispersing heat quickly around the cooking surface. These help with fast cooking times but the Kamado already had those with the insulation and heat retention provided by the Ceramics. The Cast Iron Grates here where put in more to help with the evenness of Grilling. Cast Iron is better than Steel at maintaining heat at an even temperature all the way along the cooking surface. So, you aren’t going to get well-done Steaks on the outside and rare on the inside. Every thing will be how you like it. They fitted Dampers to regulate the Air-Flow to enable Smoking and use of these will take a little time to learn. So this is not something you’ll be Smoking with right off the bat. You gotta put a bit of time in here to learn what works best on low heat. They way I do it is this: For Smoked Steaks, I set the Grill to between 200 and 230 degrees and then I close the top Damper and 3/4 close the bottom Damper. For Chicken, Burgers and things like Ribs, I close both Dampers 3/4’s of the way. Experiment. Work out what works and what doesn’t. To get the terrific Smoked Clay Oven experience, take your time. It has exactly the same design and successes as the Original Akorn Kamado but also it’s failures. The big things are taken care of. This Grill makes absolutely outstanding food that really does taste like it just came out of a Ceramic Oven costing thousands. It does it by insulating with thick Steel and new Ceramics made by Char-Griller. So mainly the design, but also the Grates are a good Cast Iron building. The Dampers and the design enable you to Smoke as well as Grill which adds a degree of variety here. Results in Smoking are great but it’ll take time to learn. For food, it’s up there with the best Weber Grills. Unfortunately, the Handles and Stand seem like a last minute thing that they just threw on there. They look and feel flimsy. It could have done with Wheels and the size is half that of the original Kamado. Although it’s half the price too. Can you put up with the useless Stand and Handles, for restaurant standard Ceramic Grilling? Can you put up with the size? If so you should buy it. If not then look for something else, perhaps the Original Kamado. It would at least give you the same taste but with much more room. Thank you for Reading.